The Tourism Authority of Thailand (TAT) is hosting international media to a five-day fam trip to promote ASEAN Connectivity and travel between Myanmar, Thailand and Lao PDR. The trip links Bangkok with Mandalay, then Chiang Mai and Luang Prabang. According to the preliminary figures for2016, the international visitor arrivals to the ASEAN region totalled 116,113,271, an increase by 9.62 percent. The tourism revenue in 2015 generated approximately 133 billion US Dollars, a growth of 12.1 percent over 2014. 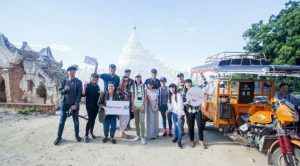 The ASEAN Connectivity media fam trip highlights Thailand’s potential as the region’s primary aviation and tourism hub. As low-cost carriers add new flights around the region, this will help make these action-packed itineraries possible, demonstrating how air connectivity between secondary tourist destinations will help maximise the immense tourism potential. At present, there are around 600 international flights per week operating their routes, departing Thailand to other destinations in the CLMVT. 299 flights fly to Myanmar; 190 to Vietnam; 108 to Cambodia, and 61 to Lao PDR. In addition to aviation, travellers are able to opt for a road trip crossing Thailand as a focal point to other regional destinations via land linkages. The North-South Corridor will resume from the south of China, Thailand, to Malaysia and Singapore while the East-West Corridor originates in India and finishes in Vietnam. To that end, TAT is also spearheading discussions with airline partners; such as, Thai Airways International, Thai Smile Airways, Bangkok Airways, Nok Air, and Thai AirAsia about the possibility of opening new routes connecting major cities as well as routes between secondary cities. The recent direct flight is Quang Binh- Chiang Mai launched last August. This flight will facilitate tourists from Thailand’s tourist hotspot to Vietnam’s secondary destination or vice versa. Some of these talks have been materialised as highlighted in this ASEAN Connectivity trip, which builds on a recent ‘Explore Thailand and MORE’ fam trip for international travel agents hosted by TAT from 6 to 12 September, focusing on four key experiences that highlighted new destination combinations. These included ‘ASEAN Romantic Treasures’, which connects Thailand’s Ko Samet, Cambodia’s Siem Reap, and Viet Nam’s Ho Chi Minh City; ‘ASEAN World Heritage Cities’ that combines Bangkok, Sukhothai and Chiang Mai in Thailand with Luang Prabang in Lao PDR; ‘ASEAN Gastronomy Local Experiences’ to showcase Thailand’s Bangkok and Ayutthaya combined with Malaysia’s Malacca and Kuala Lumpur; ‘ASEAN Kingdoms Journey’ highlighting Bangkok, Chiang Mai and Lamphun in Thailand and Mandalay in Myanmar. This year, ASEAN celebrates the 50th anniversary since its founding, with the campaign called VISIT ASEAN@50. To celebrate this occasion, ‘Southeast Asia’s 50 Golden Trails’ have been launched, which offer a wide of choices of routes ranging from a 4 to over 16-day journey. The recommended tour package features destinations in all 10 ASEAN countries that are easily linked together to reflect the uniqueness of ASEAN. For more details, please visit http://visitasean50.com/top-deals.